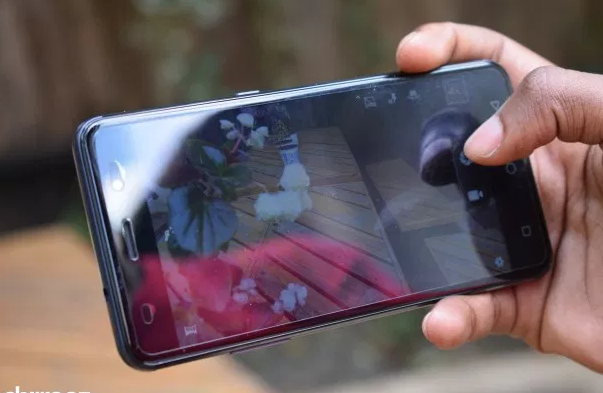 A smartphone reviewer once said the rate at which smartphones are being launched into the African market can be likened to how often we blink per minute. This sounds outrageous but I agree with him. Now I about to tell you a little about a new cheap smartphone that has been in the market since 2017, but it seems borrowing Elon Musk’s company name "TELSA" still did not help to market the phone. The display is quite high-resolution for its size, it does have decent viewing angles but struggles with visibility in direct sunlight – I wish it got just a little brighter. It’s quite a small phone with no “full screen” shenanigans, so this might be a deal breaker for most but you’ll definitely enjoy the handleability of the device as everything is within reach. The power button and the SIM slot are on the right and the volume rocker button in the left. There’s a headphone jack in the top and a USB port for charging. There are also two grills with one faux and the other for the single speaker. The lower bezel has physical capacitative buttons although they’re not backlit. If you’re coming from using on-screen navigation buttons, they’ll be some unlearning to do. On the top bezel, you get the camera, selfie flash and the earpiece and a notification LED. On the back, you get the Tesla logo and the horizontal arrangement of the camera with a slight bulge, the flash and a fingerprint sensor. Unfortunately, Tesla 6.3 runs on Android 7.0 Nougat. It’s a stock version of Android, so there’s no bloatware, which could pass as “boring” to some people. You can get a customer launcher to personalize your phone – I got Nova Launcher but it all depends on your preference. A quadcore MediaTek MT6737 powers the phone. I was sceptical at first when I started using this phone but it exceeded my expectations. The 3GB of RAM coupled with 32GB of internal memory held their own and tasks ran smoothly whether its opening light apps or mobile gaming. I wasn’t disappointed and that’s a huge win for the phone. The phone’s dual 4G LTE provided me with excellent call quality and a reliable internet experience for streaming, downloading apps and browsing the web on both SIMs. The 13MP rear camera and 5MP selfie camera both come with LED flash, just to point that out. Within the camera software, you get the usual modes from Panorama, beauty mode and surprisingly, a manual mode. When in well-lit areas or during the day, the rear camera and the selfie camera do a good job. But in low light scenarios, you’re gonna need to be more forgivable as you start to notice the drop in quality, lots of noise but playing around with the manual mode will help you better the situation. The photos look good, the sharpness is correct, the details may be improved but the dynamic range is not good enough. Tesla 6.3 comes with a 2400mAh battery that will be sufficient for daily use, considering the hardware it has to power. It’s a small battery but it’s optimised so well to push you through the day. If you charge it in the morning, it will go till late evening before the battery needs a recharge. If you want to extend its battery life, there are battery saving options you can toggle to make it last longer. It doesn’t come with fast charging but one and half hours of charge can make it go from 0 to 100%. Uhh, I don’t know. Phones in this price category have really come a long way with lots of good things going for them. With all honesty, the device left a favourable impression on me, but offerings from Xiaomi, such as the Redmi 6, blow this Tesla out of the water with far much better specifications and even lower price tags. At N45,000, there’s something much better for you out there, but if your heart wants some Tesla love, go right ahead and buy the Tesla 6.3.